Image taken at Mesquite Wash, Four Peaks foothills, Maricopa Co., Arizona. 2002. 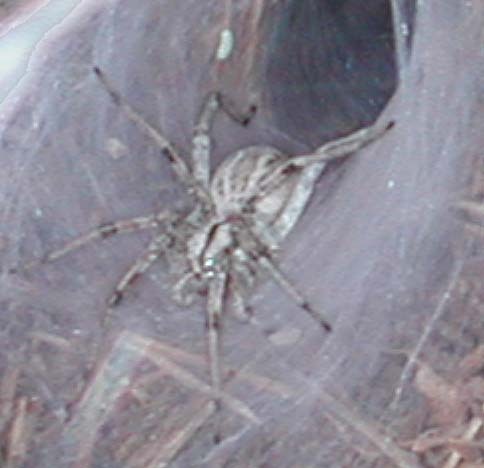 Mesquite bosques in the Sonoran Desert are the most likely place to find funnel-web spiders. On a chilly, damp morning (a rare event here) the webs suddenly are easily visible as droplets of dew collect on the fine silk. Usually the webs are close to the ground with the tunnel-retreat built into a vegetation-fortified crevice. If you look at the funnel web spider's trampoline from the side you will see a lattice of fine silk threads crisscrossing overhead. These transparent guy wires serve to knock passing airborne insects onto the web below. With astonishing speed, the spider rushes out to gather victims before they can regain flight. Please note, Sonoran Desert agelenid spiders are completely unrelated to the Australian funnel-web builders whch have received so much media attention. Indeed ours are harmless to people and any exterminator trying to persuade otherwise for purposes of offering control of Arizona species is being dishonest.